First off, this trip was all about experiences rather than the shopping that I thought we might do, in Bangkok. We didn’t get anything made for ourselves, nor did we load up on trinkets. But boy are our memory banks full! Can you tell which is Monkey and which is Demon? Day 1 – From now on I’m not counting any travel days as holiday days. They’re too draining. Can you believe we were half way to Thailand when the airplane turned back and landed at Darwin? I suppose I should have suspected things were going south when our ‘holiday drink’ at the Melbourne airport of Gin and Tonic came to us as Tequila and tonic. (Which was quite tasty) Not that I was unhappy for them to do the safe thing - as they said they’d lost 2 electronic generators and didn’t want to continue with no redundancy. Good call, but Darwin?? We spent the day there with enough time to go to the beach night markets, have some dinner, catch a couple of hour sleep before we had to get a bus for the next plane at 3:30 am. I had an odd rash appear on my left hand in Darwin which started as about an inch of teeny tiny blisters which were itchy like crazy. The rash spread all over the top of my left hand, and onto my right, moving down around my inner wrist and starting on my palm. I think it was a reaction to the malaria medications and the heat as the itching eased up when in the cool. If I was a cartoon character, I’d have been Lizard Girl. Day 2 - We finally arrived in Thailand, found our limousine, sounds fancy but was included with the room, which whisked us away to the Swiss Lodge hotel to settle in before exploring for an hour. The hotel is older, but well placed and the staff were fantastic. We decided for our first night we would go to an extravaganza dinner show called Siam Niramit which included a buffet dinner, cast of hundreds, Elephants to pat and feed, and outdoor displays of dancing before the show, and a mock up of a traditional Thai village, with demonstrations of silk weaving, and more - then inside for the extravaganza, performed on a stage which is in the Guinness book of records for being the highest theatre. The stage had a canal built into the front, for the gondolas paddling across, Elephants and actors wandered across the stage, people flew through the air and actors often appeared in the audience. It was a great night. Day 2 - Tuesday – we got up at 5:45 – ready for pick up for trip to the water markets. 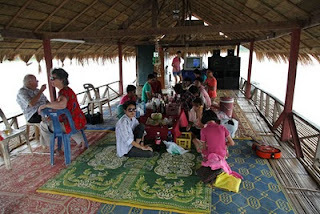 It was a 2 hour mini bus drive, and then long tail motor boat to the markets where we moved into a paddleboat. Great fun. My cheeks felt sore from smiling. We paddled amongst many boats, with traffic jams where the boats were rubbing up against each other, people calling out to each other, and pushing boats off with a totally festive air. The sun was hot and reflecting off the murky brown water and we were warned not to put our hands in the water (and later were told the canals are full of snakes). I was drenched with sweat! I loved being amongst the tropical fauna again. Banana trees, palms and cane, and the chirping of geckos were like long lost friends welcoming me back to life in the tropics. The colours of the foods and other goods were exotic and a feast for my eyes. The smells a mixture of sweet and savoury with a bit of pond smell wafting through, mixed in with lots of sweat, as we were so close to others. The water market boats were thin and long with one or two people in them, filled with their wares. They used a paddle to propel themselves, the canal is only 6 ft deep, and when they want to slide up to you, they had a hook on a long stick which they used to pull themselves over. All manner of foods, deep-fried bananas and coconut; noodle soups; fruits and vegetables; as well as trinkets and clothes were for sale. Our tour guide told us to barter for everything, and make sure to go for 30 to 40% less than their asking price. I felt ridiculously triumphant when I bartered for a little jade elephant, which they wanted 400 bat for and got it for 200. It was the thrill of the barter I enjoyed so it didn’t bother me when later I saw it in the market on shore for 100 bat. I was hot as a firecracker and sweating like crazy so my next barter was for a hat. Graham and I laughed a lot as it was quite hideous but it doubled as a fan, and was part of the fun. We left the floating market and our next stop was a snake show, with cobras and all sorts of deadly poisonous snakes. We watched a man play with a cobra; and swing other snakes around by their tails. I’m fairly sure they were as surprised as the audience when the snake slid out of his hands across the arena high enough to make the people in the front row move quickly. However luckily it slid down the wall into the water. Another man toyed with 3 snakes, picking up two, then the third with his mouth. They had a mongoose in a glass box and dropped a snake into it for a few moments to show the mongoose’s aggression to snakes. It happily attacked the snake, giving no quarter. This was a bit over the top, but part of the package. From here we went to the Elephant Village where I was beside myself with excitement as here we could ride an elephant. Not a disappointing ride around a ring, but through some jungle even walking through a pond. We paid our money, and climbed up the tower to get on, and I rather ungracefully clambered into the 2-seater seat, put on our ‘safety belt’ and off we went. It was very high and the motion was jerky and side-to-side. 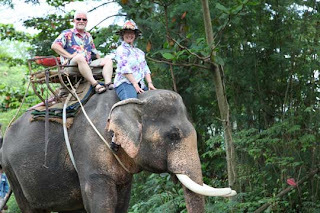 I brazenly asked the fellow if we could sit where he did (on the neck almost on the head of the elephant), and to our amazement, he slid off and on I went. He took our camera and walked ahead and I was in control. It was magic. The Elephant had coarse sparse hair, and quite thick hard skin, but I was in heaven. I thought my smile would split my face. After quite a while, Graham and I switched and he was the driver. It was absolutely fantastic. The Elephant ride was it for me, fulfilment of a life long dream. It didn’t matter what happened next, I was satisfied. From here with smiles we could not stop, the driver told us we were off to the handicap place where they made woodcarvings. He’d told us about this earlier and cautioned us not to buy wood until we went there. Who wouldn’t want to support the handicapped? Except when we got there everyone seemed to have their faculties & all their digits. Our driver was actually saying handicraft place not handicapped. The work was amazing – with intricacies that boggled the mind depicting historic events, 3 dimensionally. However, there was nothing that interested us, which we could fit into a suitcase. Next was the Crocodile and Elephant shows – we started with a buffet lunch which was a selection of curries and rices with some unusual sweets the consistency of a Turkish delight but hard on the outside. 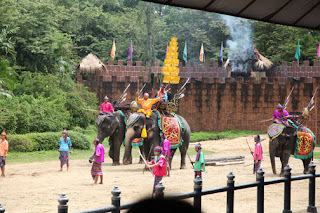 Then we were herded over to the arena to watch a show on the history of Elephants in Thailand. This included a number of Elephants giving demonstrations of their skills, dragging logs, picking things up, racing against each other, even playing soccer kicking giant soccer balls into a giant net. 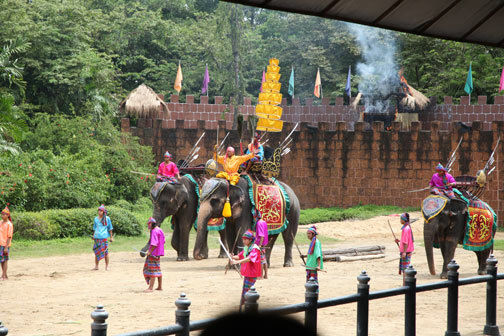 Then the history of Elephants in Thailand including a staged battle to show how elephants had been trained for warfare over generations, including cannons firing from each side, and a hut set alight on a castle turret, and sword fights. All very dramatic and great fun. As we walked to the Elephant show area we passed 2 tigers. Graham asked if we could pat them and we were allowed to sit behind them, hold their tales, and pat their backs. The one I patted curled his tail up and around my neck. They were very soft and reminded me of Elwood, I wondered if this was something normally done prior to eating (me), or if it could feel my mojo. 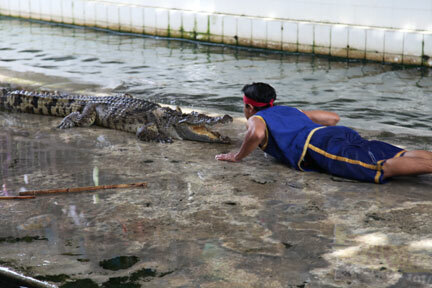 They also had a crocodile show – where the handlers went in the water with them. 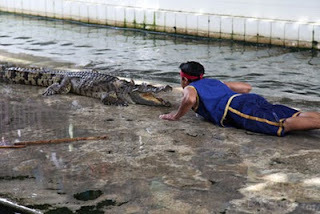 One man did a body slide right up to a crocodile, and kissed it on the snout, another time he slid up to it then jumped over it. They put their hands in their open jaws, and one fellow even put his head in. Go figure. We looked at each other, smiled and said - Billabong Park rangers should see this! Pussies. On the way out we saw baby elephants and had to go over to pat them. A group of young girls were taking photos and shouted with glee when the little fellow let Graham pat his head, then smacked him with his trunk when he realised Graham didn’t have any food for him. It was hugely funny. Last stop was the rose garden park with a display of Thai boxing, traditional dancing and more elephants. By this time we were pooped and thought our day was done. After a long drive back, we ended up at a Government Jewellery factory where they showed us the process of making jewellery, the raw stones of Thailand rubies and sapphires; how they cut and polish them, then a huge showroom filled with amazing jewellery. Some of the stones were the size of chicken eggs. It was fantastic to walk through. With the traffic, heat and humidity turned to rain, it was nice to spend the 90 minute air conditioned cab ride (for a trip that would normally take 20 minutes), compounded by the fact that the prince had company for dinner, so the police shut the road down until the convoy had been escorted through. I was sure when we got back to the hotel we would find our invitation but it wasn’t there. We weren’t dinner hungry, so we wandered the famous PAT PONG night markets, bought a couple of pastries & some gin, and went back to the hotel to relax over a G & T and movie or two. We decided to cancel the tour we had planned for Wednesday and spend the morning checking the local sights, then the afternoon shopping. 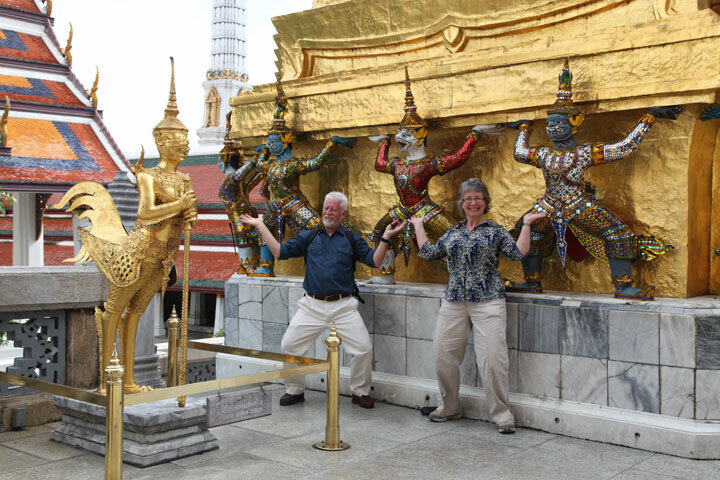 Weds Day 3 – We thought we would have an easy day, just visiting the Grand Palace, and the Wah Poh temple where they teach the Thai massage. We took a cab to the palace, and had a fantastic tour guide. She rushed us through, told us where to take the best photos, and positioned us for photos she took for us. She has been a guide there for 20 years of experience and was hugely knowledgeable and funny. It was terrific however, things went a little south when we followed her recommendation and took a boat trip which was to end up at the the Wah Poh Temple including a 15 minute stop at the Golden Budah temple. The driver had other ideas however, and it turned into a 1/2 hour of choppy water, splashing at us, and no stops, but was still pleasant enough to cool down for a time. Then we took a tuk tuk (open cab) as we were told the temple was closed until 1:00. The driver was directed by a man we met to take us to a temple which is only open only 1 day a month, and as it happened, this was the day – beside a turtle pool with a 100 year old turtle in it. The driver asked if we were hungry, and said he would take us to a good authentic Thai Restaurant, then the obligatory jewellery store and go back to the temple which should have been open by then. We loved the tuk tuk ride for the first couple of hours and he did take us to a great local Thai restaurant to have lunch. They took him a drink and some food outside, a kick back I suppose to bringing us there, but the food was wonderfully flavourful and not expensive. Some military folks sporting many medals, and suited gentlemen with body guards came in which seemed to confirm this was a good restaurant for locals. However here is where we got a taste of the Thai shell game, as our Tuk Tuk drive then took us to a 2nd jewellery store, and a clothing factory while he went to “fuel up” – so we lost an extra 90 minutes trying to get him to take us where we wanted to go. By the time we finally got to the temple, we were hot and disenchanted with the ride. However, we were glad we were there and it was interesting throughout. We decided we’d take a guide again, as we wanted to leave early so we didn’t get stuck in rush hour traffic. Our tour guide this time had 3 teeth, and shuffled slowly like he should have had a walker, (reminding me of Tim Conway from the old Carol Burnett Show) He had a set route he followed, including a visit to the "best and honest fortune teller, good luck charm sellers, and print makers", who he tried to insist we visit. Back home, we had a drink and relaxed, before a wander around our neighbourhood. We strolled the alleys and had dinner at the seafood restaurant the cab driver recommended. The restaurant had 4 floors and was packed with locals us being the only foreigners there. If the locals go there, we figured it must be good and it didn’t disappoint. We had crab & prawn balls to start, and then curried mud crab with fried rice. Fantastic. Day 4 -Sept 1 - We thought we’d do a bit of shopping before we caught the flight up North. Although the shops are open until 10:00pm, they don’t open until 10 or 10:30 am. With no stores open, we decided we should leave a little early for the airport and were happy to just relax until we left. The flight was a quick 55 minutes, in which time they gave us a boxed lunch, a cup of tea and then tidied up and we were there. John and Rut were at the gate waiting for us with big smiles on their faces. We made a couple of stops on the way home the drive was filled with rural delights. We passed rice, cane and tapioca fields; by the way did you know tapioca was also what they make MSG from? We stopped at a little restaurant along the way where Rut bought take away BBQ chicken, pork, sticky rice and sausage, which you see everywhere along the roads. The chicken is deboned and splayed out on skewers, ready to lay out at home and eat with your fingers. We had a sneak peak at the “mud market” (aptly named as it’s on a street that is muddy from all the people walking on it.) and drove down a street which had lamp standards with white elephants, holding the light with their trunk. Fantastic. Rut stopped and bought some Durian fruit already peeled which he wanted us to try right away. We thought it was supposed to stink, and double-checked with John to make sure he was OK for us to open it in the car first. It didn’t smell too bad, and the taste was not unpleasant. It was like a sweet sautéed onion even to its softness. Rut assured Graham he could get his crispy crickets to eat at the market later I was undecided if I’d join him on this one. Past the village onto rural roads, we turned the corner to John’s property which is 3 rai large. They had dug 2 ponds, one that works as a filter for the grey water, and a larger one, which has a floating, thatched cottage on it. There is the main house, the first guesthouse (which John liked so much he now lives in) and the 2nd guesthouse which we are in. Our little house was delightful. One big room holding a large teak king sized bed, 2 large leather lounge chairs, a big wardrobe and a bathroom (John took great delight showing us the toilet lid which automatically lowers down). Our guesthouse balcony faced over both ponds and it’s where we enjoyed having coffee in the early morning before we met John. The peace we felt sitting there, watching the village people as they made their way to work in their rice paddies smiling and waving, listening to the frogs, was soul refreshing. You'll have to check out the power point for photos of their place. John also built a community radio station on one corner of his property. There are a few people who come and do talk shows, and the computer runs music when it’s not attended. It’s a great landmark with the tall tower topped with a red light, so tall in fact not long ago it was struck by lightening. John’s land is set amongst rice fields, with a view to the mountains on one side which he enjoys when sitting at his computer, he finds it very inspiring. The view is soothing and ever changing. Once settled, we met on the big house patio for Martini’s and reminisced. This is where we spent most of our time when we were home. 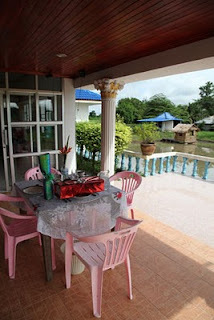 A tiled patio with a concrete balustrade, over hanging the big pond with a view of the road to the village on the other side of the pond, our house to one side, and a rice field on the other, all very serene and picturesque. We moved into the big house for dinner where we met Rut’s nephews and some other friends of Rut’s joined us. Two keg sized martini’s and a couple of red wines later, and I went to bed early. Graham followed later after checking the stars in this new night sky. It was very quiet and dark. It is a slow and peaceful pace here. Our daily routine was to appear around 9:00 am for coffee and breakfast with John on the patio; although Graham and I sneaked over and make coffee for ourselves when we got up and enjoyed it on our own little balcony. We'd chat on the patio for an hour or two, and then head off around noon on whatever adventure they had planned for us. Lunch was around 1:00 wherever we might be - ending back at the house for cocktails at 6:00, a perfectly made Martini shaken not stirred and icy cold. Then a series of dishes expertly prepared by Rut for dinner followed by another drink or two on either the front or rear patio. Sept 2 – Events - Rut took us to the local market. We bought some Gold fish for the little pond beside the house. Lunch in town with John at the Telephone restaurant (called this because it’s beside the telephone company), then a traditional Thai oil massage for both of us (Graham’s first ever) for 90 minutes. We thought that was a long time, but Rut assured us he normally gets his massage for 3 or 4 hours. Two little children were peaking and giggling at us as we lay on the table. The massage was fantastic and thankfully the ladies were slight as they actually knelt on us off and on during the massage. The ladies drove us back to the house, where we met Rut and headed off to the food market. We tried all sorts of odd things there, and enjoyed the ladies kidding with us. With Rut’s help interpreting, one group of ladies asked if we could find a husband for the youngest of them. We also found some deep fried grasshoppers for Graham right beside the live and deep-fried cockroaches. The grasshoppers were BIG (photos in power point) – and of course I was only game to try one when I got the nod of OK from Graham. In actual fact, they tasted like a deep fried crisp; all you could taste was the deep fried flavour, and some seasoning and a slightly citrus after taste, I was thankful and pleasantly surprised. (Let me be clear – there was no gushy guts – all crunchy) This hugely amused the people on the street. We also bought 2 live turtles and brought them home to set free in the pond which Rut assured us was very good luck. Home for cocktails, then Rut made the most fantastic Tom Kai Guai soup, cashew chicken and vegetables for dinner, which we enjoyed with Tik, a lady he works with who spoke English. Another lovely night. Saturday - Sept 3- we got up at 5:15 am to walk to the Buddhist Temple in to our local village of Banongwaton (Which is just outside the larger town of Phu Khieo) for 6:00 am bringing with us oranges and bottled water for the monks. It was a lovely time of day not only for the cool air, the muted lighting, and the quiet rustle of people getting ready in and around their homes, I also enjoyed the sounds of chickens cackling, roosters crowing and dogs barking as we walked along. Rut told us, don’t think you will be able to go there unseen, everyone will be watching. I’m sure we stood out. Adventure planned: Silk Village – a village over an hour away - with many stores all selling silks, some local, some commercial. There were showrooms of goods made up – but they were made in sizes and styles complementary for the slight Thai physique, but not so complementary for us larger westerners. We watched some girls hand paint silk cloth, and bought a couple of scarves and table runners but after 3 shops, decided it was time for lunch. It was ridiculously hot and humid. It was also quite difficult to try on anything being so damp and sticky, so I quickly lost interest in shopping. To be honest, I somehow thought I’d see silk items everywhere, and thought I’d do most of my shopping in Bangkok. However, I was wrong. 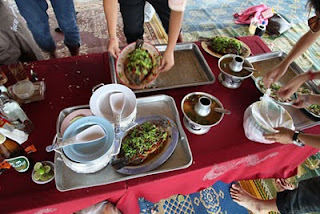 We stopped at a small plaza on the way home which had a restaurant, with hot plates built into the table tops- for steam boats – a fabulous idea! And had coconut ice cream for desert. First time ever I had ice cream with nibblet corn as a garnish. Dinner menu – Rut made us fabulous fried rice – and ordered what they call ‘naugutak.’ This is a charcoal grill – a large thick walled bucket filled with charcoal over which is a metal dish sits which is filled with broth, noodles and vegetables, like a steam boat – with a metal grill sliding over the centre, for grilling the thinly sliced meats and sea foods. 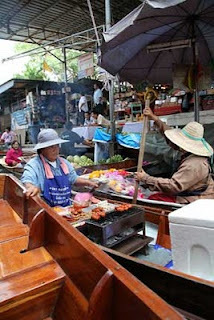 (Similar to a steam boat with the addition of the BBQ grill in the middle) When you order it from the store, they send it out on a motor cycle, with the 2 open LIT charcoal braziers on the sides glowing and sparks flying off them as they scoot down the road. It comes with all the all the meat, fish, veggies and noodles you could want in plastic bags. The next day they return to pick up the buckets. Fantastic. Sept 4th – Sunday – we decided we’d take a walk down the road towards the mountains to stretch our legs before we went on “the boat trip”. It was beautiful – everything very green (The rice will mature around December). We passed chickens as skinny as native hens, cows so skinny I couldn’t imagine they’d be bred for beef but they are – with ears so long and floppy they look like baba jigs from star wars. We carried on and passed many people who all smiled, and waved and called out greetings. It was hot as hell, what were we thinking walking in the heat of the noon sun. Adventure of the day: The Karaoke Barge. This turned out to be a huge event. John waited until many people arrived, from granny to teens, and we piled into two vehicles with people crammed in everywhere. There were 2 girls stuffed into the hatch back of our car, and a pick up truck with the back full of young lads. We took all manner of liquor, a guitar, and off we went. We drove for an hour or so to the base of the local mountains to the reservoir. Our stop had barges around 5 meters wide by 9 meters long, with music pulsing out of one of them as they sat tethered to the beach. At our barge we slipped off our shoes, and got on and our young Thai friends organised everything. Ice and glasses appeared, drinks were poured, a menu consulted, the lines let go and off we went. They even loaded 3 plastic chairs for John, Graham and I to sit on. The temperature was cool as rain had stared, but the thatched roof kept us dry as rain drizzled down the fronds and into the lagoon. (A handy way for us to wash our hands later.) The floor was covered with intricately woven rugs made from palm fronds over cane pontoons. In the centre, was a low table, which everyone sat around on the floor, the back housed an electronic centre with a karaoke centre HUGE speakers, a large TV screen to show the words in Thai script – and a toilet in the corner. (The toilet was a squat toilet with a barrel with water and a scooper to flush). It was a festive atmosphere, first the cards came out and Jew’s mom (who we nick named Granny – although she was my age … which would make her … youthful and full of fun... like me!) and the young folks were gambling. I took my 20 bat (less than a dollar) and went over to join in. Really Granny played my hands as it was similar to black jack but different and I had no idea what I was doing but they all shared my joy at wins, and laughed with me at my losses. The drinks flowed, and we floated past a damn, and many ‘cabins’ at the water’s edge, available for rent if you wanted a secluded spot to spend the night. A meal had been ordered before we left the bank - (crispy skinned fish – prawns – hot as fire crackers – fried rice – 5 vegetables – and an assortment of other foods) – and after an hour lazily floating along, a long tail (motor boat with a long shaft motor) came up beside us bearing our feast. Everyone pitched in to transfer the food over and we ate off plates with our fingers. The food was fantastic, as authentic Thai food is. One could be forgiven for assuming we were assigned people to attend to our drinks - as every time we put them down they reappeared full and perfectly made. It appears there is a Thai custom a glass should never be allowed to become empty. As the food and liquor was consumed, every one seemed to unwind and they started singing Karaoke. It was ridiculously fun. There were one or two outstanding voices, a couple of them had all the moves and everyone had fun. After several hours of floating around in the cool, all too soon we were back at shore, and heading for home. We refreshed ourselves with a shower, then unbelievably we had a martini waiting for us on the patio, and Rut and the kids were cooking again. They assured us Thai people love to eat, and eat all day long. We enjoyed tamarind shrimp, another type of chicken soup, another fish dish with julienned veggies and rice, then retired to the back patio over the pond, for drinks. Having such an accomplished cook catering to us was fantastic. As we talked, lightning bugs (fireflies) flashed messages to us from the dark. One came to our table and alighted on a napkin and we watched as its bottom flashed and lit up. All of us admitting we’d never seen a fire fly up that close before. I loved the feel of tropical night air, thick like velvet caressing our skin as we listened to the cacophony of frogs and crickets as they serenaded us on the porch. Another fantastic night. Adventure: Rut had planned a trip to some caves, mountains &; waterfalls for us. We left John to have a day of peace without us, and stopped on the way to pick up 3 of Rut’s friends. Fong, Chut and Jew (Phonetically). The girls were as different as you could imagine. Jew had long hair, wore make up and dressed very femininely, and stayed close to us as she spoke some English and wanted to practice. Chut dressed as a tomboy with a spikey short hair cut. She had studied English in school however it was a challenge to decipher what she was saying. The Thai language gives them different emphasis on syllables, so often I had the 10 second delay as I quickly shuffled through my mind what a word might also be. 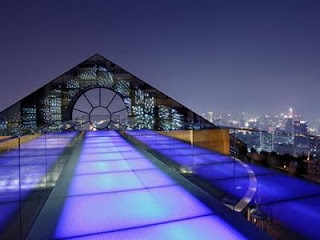 Jew had been to high school and University and had been working in the large city of Khon Kien in Tourism for 6 months. Her English was better, but there were times where we had to ask Rut to translate. Most of these kids were able to understand some English even if they had difficulties speaking it. It wasn’t until later we found out when they study English, they learn to read and write it, but have no one to pronounce the words for them. We drove through stunning countryside on our way to the caves. Our guide was a 78 year old man who was wiry and fit and talked non stop as he walked ahead. Graham commented if he’d had a click or two in his speech, he’d have been a duplicate of the little fellow in the Gods must be crazy. He would look at us, and talk as though we understood him. He carried a torch, and encouraged us to pick up a walking stick of cane. The only uncomfortable part of the caves visit was several places we stopped contained swarms of little tiny, very aggressive ants, which would swarm up your legs and bite. There were really only a couple of actual caves. Mostly we walked amongst some fantastic crevices. We stopped to look up to the sky and were impressed at the length of the tree roots, which dangled 15 to 20 meters to where we were. We approached one holes in the cliff front where the rock was very smooth. The guide told us this was snake cave, and the rock was rubbed smooth from the snake as it slid in and out. The guide assured us it was a very large cobra and I was glad we weren’t going in. Farther into the labyrinth of crevices we dropped to our knees and crawled into a couple of caves, to see some stalagmites and stalactites, and other interesting cave formations. We saw a couple of tiny bats, and Graham got a laugh from the crowd when he fluttered his fingers in the girls hair from behind and squeaked like a bat. The guide pointed to a tree, and told us God made it. He showed us back to where we started, and pointed out a tap to try to get the gumbo mud off our sandals. The rain started as soon as we drove away – we were lucky we finished our tour just wet from humidity. From here we drove through more beautiful landscape, amongst mountains; tiered rice paddies and many temples. Every time we passed a temple Rut would honk 3 times and all of them (and then us) would wai at it. It was an instant reaction from them and taken very seriously. They said it was for good luck. We wound our way up into the mountains of Loei to a little village sporting many tin roofed structures - for souvenir and food sales and resort accommodation across the street. This used to be a national park, but was now a tourist destination and the land had made available for sale. We parked in front of a lovely little park with sandstone cliffs around it, beside some kubota’s which are a covered cart/bus open at the sides with bench seating - driven by a kubota motor with a long drive shaft. Not only were we there in the off-season, it was also rainy so it wasn’t busy at all. We decided to have lunch before we went up the mountain and Rut went to work organising it for us. We had a whole crispy fried fish with julienned veggies laid over it; crispy fried cat fish, BBQ’d chicken which is butterflied and skewered and cooked over coals; vegetables; green pawpaw salad (very hot) and sticky rice. A feast! As we walked down the street a very skinny dog followed us and respectfully stayed a little ways away and settled in when we sat at the restaurant. Not so the cat which wound itself in and out of our legs meowing loudly for food. I couldn’t help myself and indulged both animals with some scraps. In the middle of lunch the heavens opened and it absolutely poured down rain. The roads became ice coffee coloured rivers as the water raced down them, and we moved farther inside the little restaurant as the rain was blowing in on us. A flash of lightning and startling clap of thunder shook us, and I nervously grinned at Graham and commented on the tin roof. “Take a look at the wiring hanging down all around you” he said, and I turned and looked at the wires, then down at my feet in a puddle of water and thought, when our number is up – it’s up. When the rain settled somewhat, we wandered through the souvenir stalls then hired a guide and kubota (15 bot per person & 100 for the guide – much cheaper than the 500 bot required if you took your car). The kubota was very fun, as it slowly chugged its way up the mountain through sticky slippery red mud and deep puddles. It came to a stop at the base of a set of steep winding stairs. There were many unused stalls to shelter under on our way to the steps, normally busy during tourist season. We climbed and climbed and were rather pleased to note we weren’t as puffed as the younger folks. Rut warned us about black bears in this area, saying they normally send someone up ahead of tourists to make sure the coast is clear. He chuckled when I told him I wasn’t worried, as I knew bears preferred sweet young girls rather than tough old foreign meat. The girls laughed at Rut's translation. The view at the top was stunning, even though the clouds hid the distant vistas. Jungle all around, and the kids clowning around in front of each others phone cameras made for an interesting stop. The Kabodo took us back and our next stop was the water falls. It was raging, and noisy and everything a waterfall should be. The rain was heavy and the girls used big tropical Elephant ear leaves as umbrellas. It was late now – 3:30 and time to head home. I love how the rains brought out the brilliant greens of the countryside. We slowed down and waved as we passed kids just being let out of the local school they seemed to get a kick out of Graham and I. Not many “farang” come here I expect. As we neared town, we stopped at the Tesco store (a small shopping mall, with a few small stores and the LARGE Tesco which is a department store.) It had 2 whole display cabinets of wieners (cocktail size) who would think there could be so many varieties? I dragged Graham to the ice cream section to show him the sweet corn and taro flavoured ice creams, however we couldn’t find any coconut ice cream to try. Purchases made, we headed to the market and picked up waffles and fruit for John’s birthday breakfast. Some roast duck, pork, rice and veggies looked after dinner as by this time it was going on 7:30, well past our cocktail hour of 6:00 and we were worried John would fret about our whereabouts. Home we relaxed with a Martini, nibbled at the lovely dinner, then spent a few hours sitting around the table over drinks in the balmy night air. In the rice field next door, I noticed a light bobbing around. The fellows said they would be people with head lamps on, either fishing or trying to catch big gecko’s to eat. Sept 6 – John’s birthday. Graham cut the fruit and beautifully laid out the table while Rut and I headed into the village. Our mission – get wrapping paper for John’s presents, ice cream for the waffles, and order the cake for his birthday. When we got into the car, Rut presented me a beautiful ring he’d noticed me admiring earlier. I was thrilled. Our plan was to serve John and Rut breakfast as Rut always looks after us. John was enjoying birthday slow motion, and poor Rut although trying to look like he was enjoying the morning, was clearly distracted and needed elsewhere, so he scooted off to carry on with the plans for the party, and came back later to eat with us. We had a lazy morning over coffee, champagne and waffles, unfortunately missed going to the temple at 11:00am, but did manage a visit to Ruts parents house. Mama had gone to their rice paddies but we met Papa. He has a severe case of gout, which has caused all his joints to become swollen and bulbous (almost like someone with severe arthritis). He has been unable to walk for 5 years and with his knurled hands it is difficult for him to even hold a cup. However, when we arrived he was sitting on the front porch with 2 of his buddies and was delighted to see us. We gave him a gift of western cigarettes and he offered us a drink of Thai whisky called. Lao Khao (sounds like low cow) It smelled like moonshine, and tasted much like tequila. The men all nodded approval when Graham took a swig of it, and they all laughed when I had my little sip. We didn’t stay long, as Rut had a million things to do for John’s party but it was lovely to meet them all. We went for lunch with John at the telephone restaurant and sat contentedly watching the comings and goings of the village people for a couple of hours before getting back to the house around 3:30. We met Rut’s Mom later when she dropped by. We think she liked the little gifts we brought from Tassie; honey and nick knacks. We had a quick nap then an early Martini before we left for the restaurant. It’s owned by a German fellow (Jürgen) who has a Thai wife, and was located on Elephant Lamp Street. The building houses an Internet den and coffee shop downstairs, and a restaurant with a balcony upstairs and serves Western dishes as well as Thai food. Rut had organised 3 long tables set up, and of course Karaoke, with an entertainer to come and sing for the evening. (The rabble didn’t start singing until much later). As the guests arrived, they would come to where John was seated, saluted him with the wai and a few words of congratulations, some with a gift; then moved to a spot at one of the 3 tables. Appetizer plates arrived filled with tempura prawns, something like a deep fried tiny omelette quite light and fluffy; fish balls, and black eggs (also known a 100 year old eggs). I was keen to try the eggs, which were the pink shelled Duck eggs we’ve seen in the market. The yolk of the egg is dark black, and the white of the egg was like a firm geletain, clear coffee coloured. However weird and unappealing it sounds, it tasted to me like a salty hard-boiled egg, and I quite liked it. Graham thought it was OK but wouldn’t go looking for another. Sure… Mr eat a deep fried Grasshopper finds a black egg weird?? There was also homemade pate; marinated shrimp; spicy roasted peanuts and for dinner we chose to share Atlantic salmon (which was salted with dill and raw) with wonderful potato cakes, and tempura. We ate, we drank, and smiled until our cheek were sore. The crowd dragged Graham and I up to dance amongst the tables over and over. Thankfully the Karaoke was in Thai so I couldn’t sing. I stood up to give a little 2 line speech to John in Thai which I had cleverly written on the back of my fan. I started by asking them to forgive my Thai accent which got a chuckle, however it appears I had a pronunciation issue when they all looked puzzled at me at the end, then Rut asked me to repeat my speach…however the thought was well appreciated. Rut asked Graham and I to sing Happy Birthday into the mike, while we had a procession of John’s candle lit cake to the table. The dancing and singing went on all night, and people kindly came to talk to us in English as our Thai was limited to ‘hello, thank you and cheers’. Some came who couldn’t speak English and just sat with us and smiled, happy to meet us. We went home around 11:30 with Graham driving one of the trucks. They were worried when Graham passed them as they thought he might get lost, however Graham recognised where to turn by the dogs hanging around on the street corners. The night was beautiful and the air silky, so we had a night cap in the dark before bed. What a fantastic day. Sept 7th –It was a slow day after the party last night. John and I spent 2 hours chatting on the patio while Graham had a nap. John said he had so much fun “bull-shitting” he didn’t want to have a snooze which I thought was a great compliment. Graham came out after his snooze to see the lovely gifts John had opened from the party and we made a trip to the hospital as Rut’s father had a turn during the night. The Hospital was quite large. Rut’s dad was in an older ward on our first visit – in a big room with a half wall between the rows of beds, about 4 rows of 12 beds per row in the room. It was crowded with family and visitors. People were also laid out on mats on the ground in the halls and everyone seemed to have at least one family member around somewhere. It was all very crowded and noisy. The set up was close, with a small bed with a bedside table beside it, then immediately the next bed etc. The meals we saw when we were there were made up of rice with some meat served on a metal tray, or rice soup if the patient wasn't up to solids yet. We felt quite sorry for Rut as he tried to look after us and his Mom and Dad. He wouldn’t think of leaving us to our own devices no matter how we protested. Jew and Chuen told us they would be coming the following morning to cook us breakfast. They were delighted with the koala pins and clasping marsupials we given them. The young folks had been watching movies in the lounge keeping cool over the last couple of days, my favourite being Pirates of the Caribbean dubbed, and a supernatural kung fu movie. Very funny. The people in our little 3 house community and extended families – Put (does the housework); Mon I think was the handiman; and he Fook & Zac were also available when John to needed them to do something for him. Rut is John’s companion and a wonderful fellow. His thoughtfulness for others, attention to detail and playful manner were a pleasure to be around. Zack’s aunt Jew another girl Chuen; Granny who is Zack’s Grandmother (we never did get to know her name so we referred to her as Granny); Jo and Eng a couple of local fellows and other young folks who drop by the house. The radio station is often DJ’d by Rut’s sister who was a bundle of fun and energy. When not manned, it has a computer program that plays music. Granny came (not the girls) the next day and she and Rut cooked us a traditional Thai Breakfast. This was delicious! Chicken feet, vegetables with pork, tiny zucchini with green peppers; 1 year old salted fish fried with garlic, chilli and onion, some fried little sausages like a cured salami, and sticky rice. We lounged around on the patio and chatted with John for the morning, then a light lunch of egg rolls brought in from town. They were lovely, served with a hot sauce, green beans & cabbage. 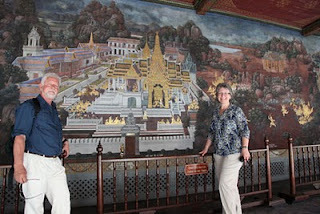 Then over to see Ian (another Foreigner from Britain) and his Thai wife Soon. Their property also had a large pond, in which they bred big fish. We enjoyed a drink on the covered patio suspended over the pond, then moved in for a HUGE afternoon tea. Chicken salad sandwiches, those little sausage croissants I love, fresh dragon fruit (good for the digestion) apples, cakes, and salad. Soon was determined we wouldn’t leave hungry. She gave me a tour of their home, which had 2 floors and had lovely views of rice fields and mountains. Back to our house and the girls had brought home crickets, and king green ants with wings, for us. We tried them raw and fried. Raw crickets tastes like prawns. Fried were more to my liking, but I think I would have preferred them crispy deep fried. However I nibbled on them happily with my martini. Put made us fantastic Pad Thai noodles for dinner, which make any I’ve had in Australia seem a sad second. More chatting for us, while Rut went to the hospital to be with his Dad. We relaxed and reflected for an hour on our last full day in Banongwaton. It had been an amazing adventure. Being in a foreign speaking country with out the normal alphabet has been quite an experience, but you know us…. We blundered our way through quiet well. Yesterday early in the morning we decided to get some excercise and walk into the big town Phu Khieo. After a deluge of rain over night, we knew we were going to be walking through gumbo mud, so we put on our hiking boots and headed out. It was lightly raining when we left, then but stopped almost immediately which made it quite a pleasant walk. We said "Sawah dee Kah/Krap" and did the “wai” which is raising your hands prayer like in front of you, to everyone we met along the way, and let me say my neck was killing me last night. People stared at us, then cracked huge smiles when we greeted them in their language. Our repertoire is small, however. We've even managed to pick up a bit of the local dialect and can say cheers, yummy, five and thanks. Five is funny as it's Ha, so a room number 555 is ha ha ha. There, now you'll know it forever too. A smile and genuine interest in people ensured we had great morning. We walked all over town, tasting a few new things at the market, snooping around a couple of shops, and walked and walked and walked for about 3 hours. Other than our water falls day, this is the most exercise we've done here. We were proud we managed to purchase a few things, and organise a tuk tuk ride back to John's, although he did take us to the bus station first in error. Everyone was very friendly but it soon became clear without Rut or someone else to interpret life in such a differerent non English speaking environment would be very limited for us. We went back into town with John for lunch at the telephone restaurant, and Graham bought his Thai guitar, which he packaged and mailed home. We hope it arrives (it should take 3 weeks). Our last day in our little village our adventure was going to the bat caves. Jew arrived almost 4;00 pm out of breath to say Rut had asked her to take us (and the entourage) on the tour to the water springs and bat cave as Rut was busy. She took the big truck and did a good job driving, however it was much bigger than the small car she normally drove, so Graham asked if he could drive. This worked well, as she could roll down the window and ask for directions much easier from this position. We ended up with Graham and Jew in the front, Chout and I in the crew cab and about 6 fellows in the back. We knew we were close when we started seeing signs to the bat cave, and when village street signs had bats on the top of them. We drove to the mountain side and were impressed with the big cave they would come out of. There were several smaller cavess in the mountain side as well. We treated the clan to little sausages on a string, fried on a grill, then dropped into a bag and sauce poured over them, and a drink and settled in to wait. Itchy feet had us all hiking up to the cave after our snack, but Graham and I turned back as we weren’t sure how far it was and had slippery sandals on. The others returned in time to watch the great event assuring us the cave was indeed smelly. The bats appeared at 6:00 precisely coming out of the top of the giant opening in a line that didn’t stop. They wer like a winding ribbon in the air, twisting and turning in formation. Like bees or a ribbon gymnast at the Olympics. There were so many, they continue their exodus for an hour. Fantastic. Rut called to say he and Granny were cooking dinner, there was food for everyone so we didn't need to stop and pick anything us, and should come straight home. Imagine our surprise when we drove up to see several people already there. Mama was there, dressed in her best, Jo & Ang, Rut’s sister, along with the regular gang and more children. Rut had sewn me a gorgeous flower necklace, and Mama presented me with a fantastic piece of traditional silk painted in gold. I was thrilled!! Mama came first, picked up a prayer string, Graham held my arm and she ran it up and down my wrist while speaking prayers and good wishes, then she tied the string gave me a high wai, turned to Graham and we reversed the process. It was fantastic, then one by one they each came up and performed this. Wishes for good health, prosperity, to come back, safe trip home etc which went on for about an hour. John instructed us - You must not cut off a prayer string, you can tug it off, or wait for them to come loose, can’t throw them away, and must put them on the ground or on a Buddhist shrine. He also told us to have as many as we had, we should leave them on as the Thai’s would definitely notice. And they did. Then we enjoyed another traditional Thai feast. What a fitting ending to our stay in this village - surrounded with good company. What a night!! The next morning was very low key, as we got ready to leave. 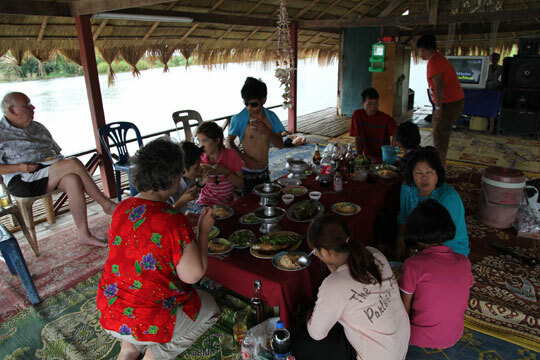 Jew and her Mom (Granny) came with us to Kon Khen as her father was in hospital there. We left feeling fantastic about our time with them, but sad we were leaving this fantastic community who had so whole heartedly taken us into their lives. 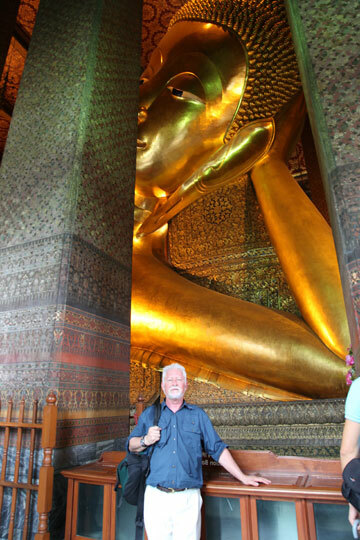 We are hugely grateful to John for sharing his magic life in Thailand with us. Back to the Big City and the hustle and bustle was incredibly alien after the peace of the last 10 days. Not only was it difficult to get back into pace, we weren’t sure we wanted to. We went to the IT mall and walked around totally bemused with the shear volume of stuff for sale. I spied an A & W so we had to have a hamburger. The menu was totally different from A & W’s in Canada – with waffles and all sorts of oddities. It made me chuckle when Graham said he felt like he needed something weird referring to a burger after all the unusual things we’d been eating the last 10 days. We spent our last full day in Bangkok putzing around. We never really got into the shopping, sorry for those who expected presents, but did lash out for one fantastic dinner for our last night. 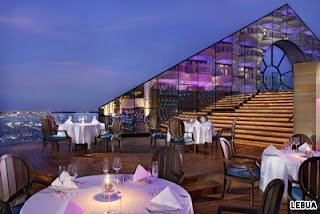 We went to Breeze Restaurant, at lebua Hotelon on the 52nd floor of one of the tallest buildings in Bangkok, our ears popped 3 times going up in the elevator. It was a fantastic experience. We’ve been absolutely pooped since we got home though. I’m not sure why as it wasn’t the most physical holiday we’ve had but it was one filled with culture and adventures and we loved it. We're going to work on keeping the slow and peaceful mojo going!! Eating was fantastic, the foods were so flavourful and varied and everything was done at a slow pace. Dinner took hours, as the food never got cold. There are many similarities to Mexico. Dogs on the streets, skinny cows, some dogs skinny some chubby, they all want to bark at you but end up smiling, giving a tail wag and walking away when you get near, and once they’ve barked at you, they are unconcerned when you pass by again. Thai village housing is minimalist, if it’s a 2 story house, it is from the old design where the water buffalo was kept below the house so it didn’t get stolen, and the family lived upstairs. Now they don’t use water buffalos for the farms, the family uses the under the house spot to sleep or as a kitchen. 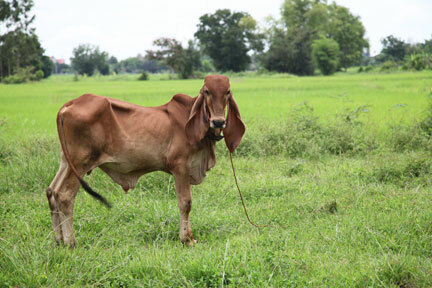 Rut remembers riding their water buffalo to the rice paddies to work when he was 8. He said in those days if you forgot to bring something along - you did without it! Sounds and smells, lots of frogs & geko calls, birds galore, the plopping of catfish in the ponds, twittering birds, lots of varieties. The put put of motor bikes and scooters, ATV’s and Kabodas (the long neck chopper like vehicles), and the soothing vision of people slowly riding their push bikes along the road. Everyone has a basket of something, or one hand full of cane, or bags, lots of the motor bikes have a metal frame welded to them like a side car with a wheel for carting things or people. The smell of the pig farm some distance away, the sounds of roosters, and the skinniest hens running around. Dogs that look like coyotes or dingos, running around lean and cunning looking, but also quite friendly, they bark at the people or vehicles as they pass, then turn around and look for new adventure. The garden workers silently doing the never ending chores of clearing weeds, with scythes, and back breaking steady work, they carry their load via wheel barrow across the road where they pile it for burning. We asked why we see so many people all wrapped up with faces covered, or balaclava type hats on, and Rut explained unlike westerners who take off clothes when they are hot, the Thai believe if they cover up more, the sweat under the clothes will keep them cool. Also a cover from the harsh sun. Giant water lilies; hibiscus; noni plants; crab claws; ginger & frangipani flowers; Banana trees, cane, Elephant ear plants, all wonderfully exotic and soothing to the eyes. Jasmine and marigolds are used extensively for making little rings to put for offerings to budda, people walk down busy streets selling them through car windows, and ladies would make them and sell them on street corners at night. They smelled so lovely, I bought one just to put in our room before I knew what they were for. The elephant lamp standards, white in our little village, and golden in another; and one other village we passed through had the golden bird lady as light standards. Ban Wah Tong is our little village. Phu Khio is the big town. Mostly I took away with me a feeling of peace and calm. Love to you all - US.